Something happens to people who visit Nepal. They come for the mountains but return for the people and relationships. No more is that true than the story of Pete Athans, one of the world’s most experienced mountain climbers. Athans has reached the summit of Mount Everest seven times along with seven or so additional attempts. He heads Alpine Ascents International, serving as a guide and informal ambassador to a country he fell in love with 40 years ago. Well it wasn’t just the country. He spent years living in Nepal, speaks Nepalis and even married a Nepalis woman and started a family. Athans along with Tenzing Norbu, vice president of the American Himalayan Foundation, spoke at a morning conference at the Outdoor Retailer Summer Market convention in Salt Lake City recently. They came to convey a simple message: Visit Nepal and support this beautiful country and kindhearted people. Months after the devastating earthquakes that left 9,000 dead and 2 billion homeless, that message is more important than ever. “It’s time to visit again and give something back to a place that we’ve taken so many images from,” Athans told a crowd of about 300 people. Tenzing Norbu, the son of Tenzing Norgay who led Sir Edmund Hillary on the first ascent of Everest in 1953, came to the convention with welcoming arms. 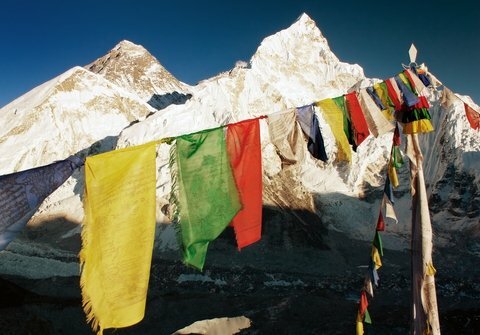 With so much of the Nepalese economy wrapped up in tourism, it’s imperative that people start travelling to Nepal again.